Porsche has announced a new and exclusive Panamera Platinum Edition that kicks off a special sport sedan series. Porsche is the leader in developing new sports cars and we see recent new examples from the German automaker with high-performance SUV’s like the Porsche Cayenne Turbo S and Cayenne Turbo S diesel. And now Porsche is bringing their passion for luxury performance to the Panamera sedan series. They have just announced a new special Sport Sedan series by offering an exclusive version of the Panamera sedan. It is called the Platinum Edition that will come in two variants, a Platinum Panamera and all-wheel-drive Panamera 4. The new Panamera Platinum will feature new platinum silver metallic exterior highlights combined with expanded standard features and exclusive details inside and out. Outside, the Panamera Platinum turbo comes with platinum colored side view mirrors, trunk lid trim, and rear diffuser. The new series is available in a number of solid exterior colors like black, white as well as the optional basalt black metallic, carbon grey metallic and mahogany metallic lacquer finishes. The new Panamera Platinum Edition comes loaded with standard features that include Bi-Xenon with Porsche Dynamic Lighting System (PDLS), main headlights and parking assist front and rear and 19-inch Panamera Turbo alloy wheels. Inside the special edition sedan gets a new black/luxor beige two-tone interior with a partial leather package, and a full leather package is optional. Other interior highlights include a sport steering wheel and the Porsche crest is on the front and rear headrests as well as the insignia "Platinum Edition" on the front door trim strips. The special sedan also features the Porsche Communication Management (PCM) system with navigation and standard Bose Audio surround sound. It comes with a high-resolution 7-inch TFT touchscreen and fourteen loudspeakers for listening enjoyment. The luxury interior also comes standard with front and rear seat heating. The base MSRP in the U.S. for the Panamera Platinum Edition will be $80,500. The Panamera 4 Platinum Edition will have a base MSRP of $84,600 before a $975 destination charge for both models. Porsche continues to be the global leader in luxury sports cars and now they take a big step in becoming a leader in the luxury sport sedan segment. 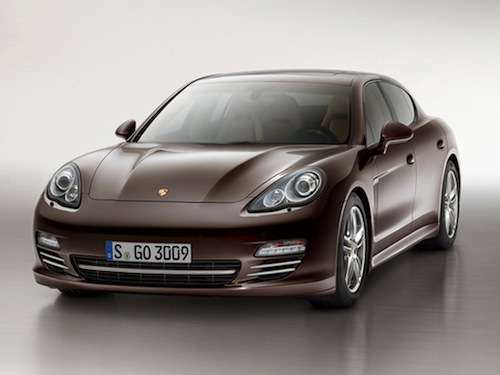 The two new Panamera models will be available in U.S. showrooms starting January 5, 2013.